I have to confess... I'm not a fan of snakes. In fact, I'm downright scared of snakes. I don't mind frogs, toads, spiders, and most insects. However, creatures that slither give me the creeps. You can image my hesitation when I sat down recently to read Nic Bishops latest nonfiction book about the scaly creatures. Bishop is known for his up-close photography, and I wasn't so sure I wanted to see snakes under a zoom lens. However, Bishop's stunning photography coupled with amazing snake facts made me appreciate the beauty of snakes. Each two-page spread includes a full-page, close-up photograph of a snake with a page of text on the opposite page. The vibrant colors and textures of the reptiles are amplified by the close-up photography. The page I found amazing shows a feathered bush viper with large scales that look like leaves. Bishop includes detailed captions to help readers identify the species. Children will love the photograph of an African eat-eating snaked with an enormous egg in its jaws. "Special spines inside the snake's throat will crack the egg, so the snake can slurp down the contents. Then it will spit out the empty eggshell and take a rest, looking very exhausted." 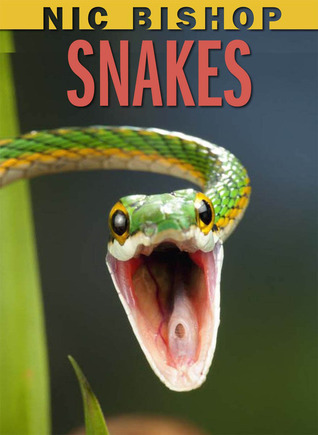 Other snakes featured in the book include the carpet python, Mojave rattlesnake, hognose snake, and parrot snake. Bishop explains in an author's note that it took him a while to make the decision to focus on snakes because he knew they would be difficult to photograph. He photographed a number of the snakes in captivity so he that could capture them in just the right light and in ways that showed off their scales or coils. Librarians only need to put this book on display, and it will be scooped up by animal lovers. Nic Bishop Snakes even made my snake phobia melt away while I was learning about these incredible reptiles.